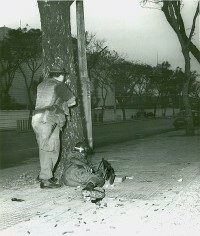 On Jan. 30, 1968, Vietnamese communists attacked the American embassy in Saigon. For several hours they held the embassy grounds, inflicting injury and damage and trapping a small group of U.S. military and diplomatic personnel within the embassy. The assailants failed ever to enter the building, and all of them ultimately were killed or captured. This was part of the broader Tet offensive, a military campaign that carried the Vietnam War from the countryside into cities and towns. In strictly military terms the assault on the embassy, and indeed the broader offensive failed. The attackers occupied the embassy compound and caused considerable damage but never succeeded in entering the building itself. All of the attackers were killed or captured. But the Vietnam War never was entirely military. Americans had been told — and many then still believed — that the war was being won. 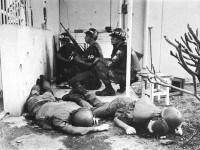 How, then, could a supposedly ragtag guerrilla army suddenly assault the citadel and symbol of America’s presence in Vietnam, the very building from which the daily war- progress reports flowed? “Viet Cong Invade American Embassy.” That incident (and those headlines and TV images) stuck in the American public consciousness, and no future body counts, pacification plans, presidential promises of victory, or even genuine military gains could ever quite dislodge it. The Vietnam War had been waged through much of the 1960s and was to bleed on for another seven years before Saigon’s final collapse. But the U.S. war effort may well have been doomed — politically and psychologically — by the events of that January night. What follows is the account of E. Allan Wendt, a Foreign Service officer who was on duty at the embassy that night. His report, written soon after the attack and then classified for years was originally published by The Wall Street Journal (which also wrote this introduction and the opening paragraphs below) on November 3-4, 1981. It is reprinted with their permission. The account was written merely as one participant’s chronology of the night’s events at the embassy. But it also raises broader issues: the unpreparedness of the U.S. military machine for the Tet offensive; the seeming chaos of a command structure in which generals (and the White House) were able to obtain instant situation reports from the embassy while the embattled defenders couldn’t get military support from colonels and majors a few miles away; the very human reactions- from clear heroism to considerably less- of individuals caught up in crisis; and the plaintive, perhaps symbolic, Vietnamese voice – that of the code clerk who, in the midst of battle, reported that he was on overtime and asked to go home. This report, of course, is history. But history has a way of remaining relevant. 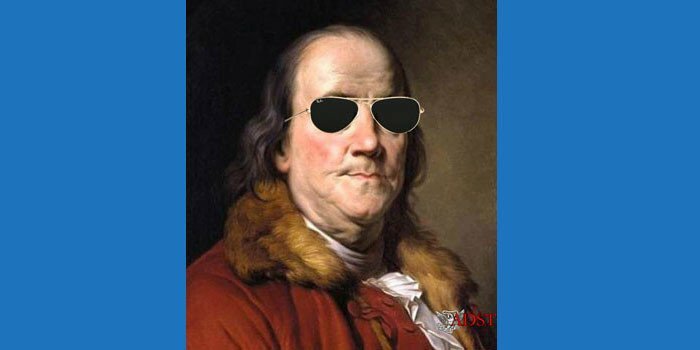 The protection of American government facilities overseas, the reaction speed of U.S. military forces, the quality of American Intelligence, the play of politics and psychology in warfare- there are controversial issues in 1981, just as they were in 1968. Parenthetical notes of explanation and identification have been inserted by the [Wall Street Journal] editors. You can see a CBS video on Tet here. You can read about how one FSO had to dress up as a priest to avoid killed during the Tet offensive and how he eventually reunited with his Vietnamese bride-to-be on Valentine’s Day. I was asleep in room 433, the duty officer’s quarters, when the building was shaken by a loud explosion just before 3 a.m. I rolled out of bed and reached for the telephone. Automatic- weapons fire broke out. 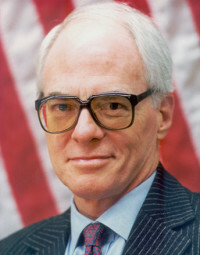 I called Mr. Calhoun at his home and told him the embassy was under attack. [John A. Calhoun was a political officer in the embassy.] As I was speaking, another explosion tore into the building. Recalling the need for shelter from falling debris in the event of a bomb explosion, I crawled under the bed while talking to Mr. Calhoun. I emerged from under the bed just as [James A.] Griffin, who was on duty in the communications, came in and asked what was happening. I said I was not sure but I presumed the embassy was being attacked. I quickly dressed, gathered up my few personal possessions, and withdrew into the communications room next door, which was safer than the duty room and had more telephones. Neither of us could know the extent of the attack or whether the Viet Cong were already in the building. One of our first reactions, therefore, was to close the vault door to the communications room. I called Mr. Calhoun’s residence, and by that time Mr. [David J.] Carpenter of the political section and Mr. [Gilbert H.] Sheinbaum, the ambassador’s aide, had reached the residence and set up a command post. I reported that I had moved into the communications room and should be called on extension 321 or 322. I told them I would pass information on to them as soon as I obtained it. I understood they would undertake to alert others, both in Saigon and elsewhere. It is worth noting that I had left the duty officer’s manual in Ambassador [Ellsworth Bunker’s] outer office on the third floor. I was not in the habit of taking it with me to the duty officer’s quarters, for I knew that much of the information in it was out of date. Even had this not been so, it contained little that would have helped in the crisis that had suddenly burst upon us. Automatic weapons fire continued, interspersed with periodic louder explosions that we took to be rockets or mortars. All of the shooting and explosions seemed very near, so much so that we feared not only that penetration of the embassy was inevitable but that our lives were in imminent danger. Indeed, we thought our only hope lay in securing the vault door to the code room and simply staying inside. We knew it would take a very heavy charge to blow that door, but we did not exclude the possibility that the Viet Cong were capable of doing it. We next called the extension of the Marine guard on the ground floor inside the embassy. I personally thought he must be dead. To my surprise, he answered, and although he was obviously very harassed, he was quite coherent. This was to be the first of many conversations with Sgt. [Ronald W.] Harper, who, despite his predicament, remained virtually our only source of information on what was happening in the compound. 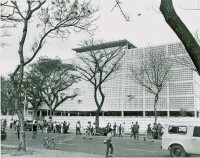 Harper told us the VC [Viet Cong] were inside the compound but not in the embassy building itself. He said he could hear them talking outside the building. He did not know how many of them there were. A few minutes later Harper told us he had a wounded Marine on the ground floor. He asked us to come and get him. With trepidation, I went downstairs in the elevator and stepped onto the ground floor. With the aid of Sgt. Harper, I picked up the wounded Marine and put him on the elevator. Griffin then came down and helped me assist him to the fourth floor. (Then, and always thereafter, we locked the elevators in place so that they could not be called down to the ground floor had the VC gotten into the building.) A hurried and fearful glance at the ground floor revealed that considerable damage had already been done. The situation of the one remaining Marine looked bleak. We carried the wounded man into the fourth floor duty room and placed him on the bed I had been sleeping in. He was covered in blood but did not appear to be critically wounded. His leg seemed broken and he was obviously suffering from shock. Unfortunately, none of us had any usable knowledge of first aid, and there was little we could do for him. He kept asking for a corpsman. We tried to call the 17th field hospital but could not get through. We gave the wounded man some water and two Bufferin tablets, and I took his .38 revolver. It was the only weapon I had and I was to carry it with me for the next 5 1/2 hours. I called Calhoun’s residence and passed on the above. I should note here that our communications all were working normally. I called Calhoun’s residence on many occasions and always got through except when the line was busy, which it frequently was. I next called Dr. [Harold J.] Holleran, the embassy physician, and told him we needed medical assistance. He said that in view of all the shooting the best thing he could do was stay home. About 4 a.m., Maj. Hudson, called. We gave him an account of the situation as we saw it. He had already heard about the wounded Marine and said a Medevac helicopter would arrive shortly to evacuate him. We were to take him to the roof and wait for the chopper. Only the Marine guard on the ground floor, however, had keys to the two doors through which one must pass to get from the sixth floor, where the elevators end, to the roof. We called Harper and told him we needed the keys. He said someone should ride the elevator downstairs, stay in the corner of it so as not to be directly in the line of fire, and he would throw the keys in. Fisher accomplished this task and was back in a few minutes. For greater security, we had in the meantime moved the wounded Marine into the code room. Had the VC broken into the building, as we expected they might at any time, we would not have had enough time to rescue him in room 433. We then set about the cumbersome job of getting the wounded man up to the roof. Fisher, who was armed with a .38 revolver and a shotgun, opened the doors to the roof, while I had not seen before and who turned out to be the OSA duty officer, carried the Marine into the elevator, up to the sixth floor and then up two more flights of stairs to the roof. When the Medevac chopper failed to appear, we took him back to the sixth floor and placed him next to the stairwell on the blood- soaked mattress that had been in room 433. The Marine resisted leaving. He was still in shock and insisted on talking to the captain of the Marine guard unit. We let him talk to Maj. Hudson, of MACV [Military Assistance Command Vietnam] COC [Command Operations Center], who ordered him to leave. At this point, two men, Fisher and the one OSA communicator, remained in a stairwell just below the roof waiting for the chopper. The OSA communicator had a snub-nosed .38 revolver and a two-way radio to the OSA duty officer, who, I noted later, carried a 9 mm. Beretta sub-machine gun. Maj. Hudson had said the chopper would arrive in about 15 minutes. After a half-hour, we called Maj. Hudson and told him there was no sign of the chopper. He said it had been driven away, and even hit, by enemy fire. This event occurred about 5:30 a.m., and it was the first time any chopper had even tried to land. Sending another chopper would take more time, the major said, since it would have to come from Long Binh. Tan Son Nhut’s operations had been curtailed by the military activity there. Maj. Hudson then informed us that two choppers were on the way, one Medevac and one chopper carrying ammunition. It was essential, he said, that someone be on the roof with the wounded Marine to guide in the choppers. Maj. Hudson also said the pilots were having trouble finding the roof in the dark and asked that the lights be turned on. None of us knew where the lights were. Griffin called Harper downstairs who explained where the switches were. Griffin and I both went to the roof, so that the code room was empty and its inner cage door locked. We were no longer locking the vault door, inasmuch as the VC, so far as we knew, were not in the building. Had the enemy broken into the building with the specific purpose of entering the code room as soon as possible, they might have succeeded. It would have been possible to enter the stairwell from the ground floor, go up to the fourth floor, and blow the steel door providing access to that floor. They would then have had to break open the wooden door inside the vault area. We assumed the enemy had no such precise objective but rather would have attempted to blow up the whole building. We were relying on Harper’s periodic assurance that the VC were not in the building, and we assumed they could not have gotten in without his knowing it. The main reason we left the vault door open, however, was that we could not have kept MACV COC regularly informed of the situation on the roof, both with regard to enemy fire and the whereabouts of the choppers, had we had to lock the vault every time we left the code room. While we both were on the roof, Griffin put on the lights. It took a while to locate the right switches and see exactly what was lit up. We flashed the lights several times, while Fisher sat in the middle of the roof and described an arc with an electric lantern. These activities were according to Maj. Hudson’s instructions. He also had warned us to get off the roof itself as a chopper came near, since if the first one was carrying ammunition and drew enemy fire, it would hover, drop its ammunition, and move out. The lights we had turned on were red, white, and blue runway-type lights and described the exact area of the roof. We called Maj. Hudson and so informed him. He instructed us to leave the lights on. We did. Nonetheless, according to the major, the choppers were having some trouble finding their way in. It still was dark, despite the flares that filled the skies. I estimate that the wounded Marine was kept on a mattress on the sixth floor for about an hour. Once we were told that the Medevac and ammunition choppers were on their way, we carried him to the roof itself, where he waited another 45 minutes until the first chopper finally arrived. On one of my many trips to the roof –I would say at about 6:15 a.m. -– I saw an armed Marine guard on the floor below the roof crawling around on his belly with a rifle. I asked him how he had gotten there, since I had assumed there was only one functioning Marine guard in the building, namely, the one on the ground floor. He replied that he had been there all the time. Not feeling inclined to ask him what he had been doing, I hurried back to the fourth floor code room to report on the situation to MACV [Military Assistance Command Vietnam] COC [Command Operations Center] and Mr. Calhoun’s residence. A half-hour later, when I returned to the roof, I was told a chopper finally had arrived, offloaded three cases of M-16 tracer ammunition, and evacuated the wounded Marine. Griffin and the OSA communicator discovered the chopper had left the ammunition in the middle of the helipad. Realizing that its presence there would hamper the arrival of other choppers, Griffin and the OSA communicator crawled out to the middle of the helipad and retrieved the ammunition. While they were in the middle of the roof, a chopper came in as if to land but could not because of enemy ground fire. I might have questioned the emphasis on ammunition, since we had only the few weapons described above and, in any case, no M-16s. In my preoccupation, however, I simply assumed this move had some rational, though as yet unfathomed, purpose. I considered that the ammunition might be for later troop arrivals, but I rejected this idea, thinking they would certainly bring more than enough of their own. I place these events at about 6:45 a.m., nearly four hours after our ordeal had begun. To my consternation, I also discovered upon returning to the roof that both the armed Marine guard and the Army soldier had left with the chopper. The OSA man on the roof had no idea why they had done so. Neither did we. We were thus reduced effectively to three men — Griffin, the OSA communicator, who remained just below the roof practically the entire time, and me. The OSA duty officer was also in the building, but I had only seen him when he helped me carry the wounded Marine from the code room to the sixth floor. There were also two other OSA communicators, one of whom I once saw in the hall of the fourth floor. Later I learned he had been handling incoming and outgoing calls, and I wish to say he was doing it very skillfully, even to the point of weeding out the nuisance calls. At this point, I should mention some of the many calls we received. They are not in sequence, and I do not remember exactly when they came in. They were handled by Griffin and by me. Frequently, we were both talking at the same time on extensions 321 and 322. Philip Habib [then Deputy Assistant Secretary of State] called twice from the White House Situation Room. The first time, I gave him a full account of what was happening as we saw it. I recall having told him, among other things, that the VC had surrounded the building inside the compound, which was in turn surrounded by U.S. MPs [Military Police] and the Vietnamese police, none of whom, however, had broken into the compound. 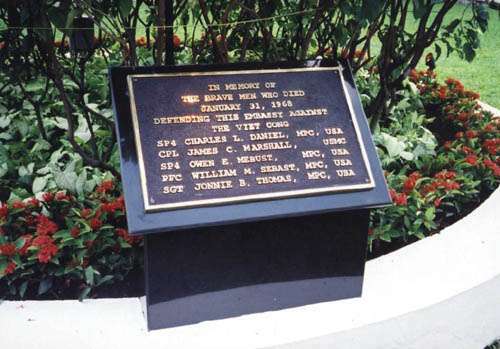 (The VC thus were protected from the outside by the wall around the compound.) I said we had been promised a reaction force but none had arrived, nor, at that time, had any choppers arrived. This was about 5 a.m.
Later, the senior watch officer at the State Department Operations Center called and asked for a sitrep [situation report], which I provided. Mr. Habib called on another occasion trying to reach Mr. Calhoun. All we could do was provide the operator with Calhoun’s PTT [telephone] number. On still another occasion, Mr. Habib called and spoke first to Griffin and then to me. As we were speaking, another rocket thudded into the building. A Vietnamese policeman called and asked for one of the OSA men. I could not find him. When I called over to OSA communications from inside the code room, no one answered. I told the policeman to call another number Griffin had given me. An American called and asked for Saigon Control, an OSA number that I did not know. The same person, I believe, also asked about the destruction of cryptographic equipment. About 7:30, Mr. Kidston of USAID [U.S. Agency for International Development] called on the phone in room 433. I had an urgent call from MACV at the time and could not continue the conversation. An American female communications employee called and asked about the destruction of communications equipment. She was appalled to learn that I was in the code room by myself and knew nothing about the equipment. I explained I had been asked by MACV COC and Mr. Calhoun to remain there and handle the incoming and outgoing calls, which were numerous. Griffin was then up on the roof. We took turns at these activities. Sometimes we were both on the roof, leaving no one in the code room. A Vietnamese employee marooned in the unclassified communications room on the ground floor called and asked for permission to go home. He said he had been working many hours and was tired. I told him I was sorry but he would have to stay where he was until the shooting stopped. About 5:30 a.m., more than an hour before the arrival of the ammunition chopper, Col. Garrison called to announce a plan to land a rifle platoon of infantry on the roof. Shortly afterwards, Colonel Fuller called from Second Field Force Victor in Long Binh to inform us of a plan to land a platoon from the 101st airborne. In subsequent conversations with Maj. Hudson, to whom we described the calls from Garrison and Fuller, we learned that the two colonels were talking about the same force. Many conversations with Maj. Hudson ensued. In fact, we asked him to keep one line open, so that we could always get through to him to report on the latest developments. Long after the ammunition chopper had arrived and evacuated the three men, no other chopper came near, despite Maj. Hudson’s assurances that they had to be there, since they had been dispatched some time previously. Frequently, the major was surprised to learn that none had landed. We called him regularly to say no choppers had come, although they could be seen orbiting a considerable distance away. Often, he asked us to hold the line while he checked on the choppers. Unfortunately, he could not call them directly, so coordinating all our information in one conversation proved nearly impossible. Sometime after the air rifle platoon was to have landed, we called Maj. Hudson and pleaded with him somewhat despairingly for relief from the ground. Finally, he said a mechanized infantry unit with heavy armor was on its way. We asked how long it would take. He said the unit was on the outskirts of the city and moved slowly. It never arrived. In the meantime, we kept passing out this information to Mr. Calhoun’s residence, to the Marine guard downstairs, and occasionally to Washington. 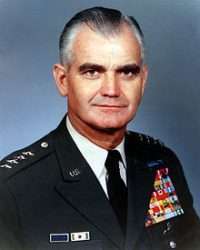 Twice Gen. [John H.] Cushman [Commanding Officer, Second Brigade, 101st airborne] called and asked for a report, which we provided as best we could. Between 6:30 and 7, Maj. Hudson called to say that there could be no landing before daylight because of poor visibility, despite the roof lights being on. Eventually, dawn broke. Maj. Hudson said the situation had become critical. We readily agreed. He said the latest plan was to gas the VC inside the compound and then land troops on the roof. The gas choppers were to be sent right away. We immediately called Sgt. Harper and told him of this plan. He pleaded with us to stop the use of gas, since by this time (about 7:30), the U.S. MPs had fought their way into the compound. We would be gassing our own men. I called Maj. Hudson back at once. After a 15-minute delay, he said the gas probably would be used anyway. At one point, he said not to worry, that the cavalry was coming. I had heard so much about the air cavalry that I thought he was being serious. In the meantime, Mr. Sheinbaum, who had been receiving regular reports from us, had told us of [Col. George] Jacobson’s presence in his house at the rear of the compound. (He was mission coordinator at the embassy.) Vietcong were either in or near the house. We assured him we would inform the paratroopers as soon as they arrived on the roof. Maj. Hudson, apparently based on conversations with Sgt. Harper, had drawn up a battle plan that he said we were to convey to the platoon commander immediately upon the arrival of troops on the roof. The plan was for the troops to deploy down the stairwells on each side of the building rather than go down the elevators, which were in the line of fire. Upon reaching the ground floor, they were to go out the side entrances and into the compound. These doors were locked from the outside and could be pushed open outwards. The atmosphere in the code room was one of generally unrelieved tension mixed with frustration and helplessness. Sometimes the tensions would ease, but periodically, another rocket round would hit the wall to remind us of our plight. There were lulls in the firing, but they never lasted long. Well after daybreak, trips to the roof revealed several orbiting helicopters, though none with any discernible intention of landing. We waited, always wondering why there was still no landing. About 8:15, I headed back up to the roof. The OSA communicator had gone back to his code room, so the roof was unattended. As I stepped off the elevator on the sixth floor, I was greeted by a strange site. Standing before me were five paratroopers in full battle dress from the 101st airborne division. They carried M-16s, M-79 grenade launchers, hand grenades, and knives. I asked for the platoon commander. Maj. [Hillel] Schwartz stepped forward, and I told him I was the duty officer. He offered me a hand grenade, which I declined. He said 30 more men would land soon. I explained that we knew of no VC in the building. While the major took some notes, I described the building briefly, repeated MACV’s deployment instructions, and informed him of Col. Jacobson’s situation in the rear of the compound. I also urged him to watch for the one Vietnamese employee on the ground floor. Maj. Schwartz, fearing there actually might be VC in the building, deployed his men so as to secure it floor by floor, beginning with the sixth. I took Schwartz to the fourth floor so that he could call the Marine guard on the ground and obtain the very latest information. He then rejoined his men. I called Sheinbaum to say the troops had landed and were deploying through the building. Two or three calls then came through from Bien Hoa Army. In each case, a general officer of the Army wanted urgently to speak with Maj. Schwartz. I said he was engaged in securing the embassy and could not be reached but that I would have him call back as soon as I could. Carpenter called and said he needed to know exactly how many VC had been inside the compound. I then made several more trips to the roof to receive incoming paratroopers. About 45 minutes after Maj. Schwartz had landed, I went down to the ground floor. There had been no shooting for a while. I was told all the VC were dead and that there were 19 of them. I went upstairs and relayed this information to Carpenter. I then went back downstairs. As I was surveying the damage to the ground floor, someone told me Gen. [William C.] Westmoreland [Commander of the U.S. Military Assistance Command] wanted to see me in the Marine guard’s office. I went there, and Gen. Westmoreland said his advice was that the embassy be cleaned up as soon as possible and that its staff be at work by noon. He then said he wished to speak to Mr. Habib. I returned to the fourth floor and put through a flash call to Mr. Habib in the White House situation room. As soon as Mr. Habib was on the line, Griffin went downstairs to fetch Gen. Westmoreland. In the meantime, I told Mr. Habib the embassy had been relieved and there were 19 dead VC in the compound. I also relayed Gen. Westmoreland’s advice. After several minutes Gen. Westmoreland arrived and spoke for about 10 minutes with Mr. Habib. 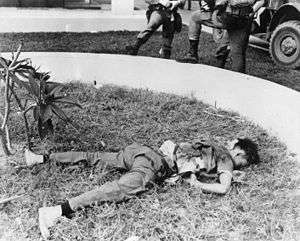 Everything that happened after the paratroopers reached the ground floor, by which time all the Viet Cong had already been killed (or captured), is well known to many others. The above account is written from the vantage point of those inside the embassy. There are, of course, other accounts, each one conveying a different part of the picture. The only thing I would like to add is high praise for those with whom I worked inside the embassy through the siege. Griffin, in particular, shared all the tasks and never flinched or failed throughout the ordeal. Sgt. Harper’s heroic stand on the ground floor needs no elaboration. Beautiful post with all the past information.Those information are very rarely known. Thanks for sharing it.